With the “Changing role of HR”, HR professionals have started showing their fortitude, by being "Strategic Partners" with the top management. They are matching pace with the growing economy, changing perceptions and contributing to the fast growth of organizations by proactively working as "Employee Advocate", "Change Champion" and being instrumental in “TALENT DEVELOPMENT”. The ultimate shared goal of both senior executives and HR professionals is to build and maintain a high performance organization and to become a talent magnet. A high performance HR Function has the potential to drive creation of a high performance organization. A competency management strategy is an essential part of human capital management. Skills and competency profiles aligned with job responsibilities and integrated with performance and learning management provide the window on talent in organizations. Competency-based hiring, development and performance management offer an objective, measurable system for talent management. By using and measuring a competency-based approach to HR activities like “ARMED”, a high performance HR function will be built. 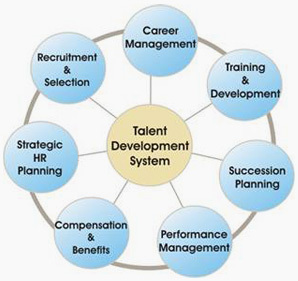 The design, care and nurturing of the talent development pipeline depends on the organization’s talent development system. This is really a meta-system, since it consists of seven smaller systems, each of which must be aligned with the others. The driver is the human resource strategic planning system, which indicates the talent required to execute the strategic plan. It is enabled by recruitment and selection, career management, training and development, succession management, compensation and benefits, and performance management systems. Failure in any of these systems either blocks or breaches the talent pipeline and frustrates the ultimate organizational goal of talent sufficiency. Want to achieve sustainable competitive advantage? Be a Talent Magnet. Because talent attracts talent, because talent can recognize other talent, because talented people want to join winning, talented teams – whether sports teams or business teams - designing and running an organization which is dedicated to talent development is one of them. It's hard work to get there and it never ends. The better a talent development place you are, the more likely others will raid your talent pool. The only defense is to keep your own talent so challenged, so rewarded, and on a continuing development track that they have neither the time nor the inclination to respond to a headhunter's call. It's frustrating when you lose someone you have developed to another organization but, on balance; it's preferable to not developing people.